You are here > Home / Sold Marlins / Marlin 39-A 39a 1st Model .22 LR Blue & Case Color Takedown Lever-Action Rifle, MFD 1939 1st YEAR! Marlin 39-A 39a 1st Model .22 LR Blue & Case Color Takedown Lever-Action Rifle, MFD 1939 1st YEAR! Year of Manufacture: 1939 (Per “Marlin Firearms” by William Brophy, p289). Markings: The left side of the barrel is marked “The Marlin Firearms Co. -MODEL 39-A / NEW HAVEN, CONN. U.S.A. – 22 S. L. & L.R.” the second line of which is bookended by arrows facing outward away from the lettering. The bottom tang is marked “3394”. The barrel assembly is marked on the inside of the receiver in a cutout for the stock “94”. The top of the stock, under the top tang is marked “3394”. Sights / Optics: This rifle is mounted with a “V” notched semi-buckhorn rear elevator sight dovetailed into the barrel and blade front sight dovetailed into the barrel. The front sight has a nickel bead. The top tang is factory drilled and tapped for the mounting of a peep sight and the cap screws are present. Stock Configuration & Condition: The stocks are two-piece smooth walnut. The buttstock has a pistol grip with an S-profile on the bottom of the grip. The semi-beavertail forend has thinning finish on the bottom edges. The left side has scattered light compressions as does the bottom. The right side of the forend has some deeper compressions, a bruise and scuffing at the rear, a long horizontal scratch starting approximately 1″ from the rear and extending forward and slightly up for approximately 4″. The buttstock has some discoloration along the both sides of the top tang with light bruising, a patch of scuffing in the right side of the wrist about halfway from the receiver to the bottom of the pistol grip, shallow but long scratches on the left side of the buttstock with deeper but shorter marks on the right side and scattered light compressions and scuffs throughout. The buttplate is serrated hard rubber with light wear around the edges and at the heel and toe. The plate is in about Fine condition. There are no cracks or chips. The wood is generally proud to the metal indicating original finish or a very light refinish. The stocks rate in about Fine-plus overall condition as original or Fine as refinished. The LOP measures 13 5/16″ from the front of the trigger to the rear of the buttplate. Type of Finish: The barrel, magazine tube, forend cap, bolt, hammer, trigger and screws are blued, the receiver and lever are case hardened. Bore Condition: The bore is bright with sharp but shallow rifling. There is no erosion in the bore. Overall Condition: This rifle retains about 90% of its metal finish. Finish is thinning on the edges of the sights and muzzle. The barrel has a small impact mark on the left side approximately 2″ to the rear of the front sight, a few scattered light marks, and scattered light freckling throughout, though it retains the vast majority of its finish. The magazine tube has light wear which has gone to patina on the bottom behind the loading port with two areas of wear which are more fresh just in front of the forend cap. The magazine tube band has thinning finish on its edges. The forend cap has thinning finish on its edge with light freckling and a mark on the bottom just in front of the flat area. The receiver retains the vast majority of its case-color with operational wear on the front of the lever, grip wear on the top tang and on the inside of the lever. The rest of the receiver and lever have strong color with light freckling throughout. The bolt has strong blue finish with moderate operational wear visible when open, moderate operational wear is also present on the hammer. The trigger has worn to white on its front face and sides, though it still has finish on its rear face. The takedown screw has light patina developing on its top face and thinning finish on its edge with a sharp slot, its knurling is sharp. The screw heads have light tool marks but strong slots, many have lost some surface finsih. The markings are clear. Overall, this rifle rates in about Fine condition. Mechanics: The action functions correctly. We did not fire this rifle. As with all used firearms, a thorough cleaning may be necessary to meet your maintenance standards. Note: This rifle was manufactured before the development of high-velocity rimfire ammunition. Use of high-velocity ammunition will eventually crack the bolt. Do not use high-velocity ammunition in this rifle. 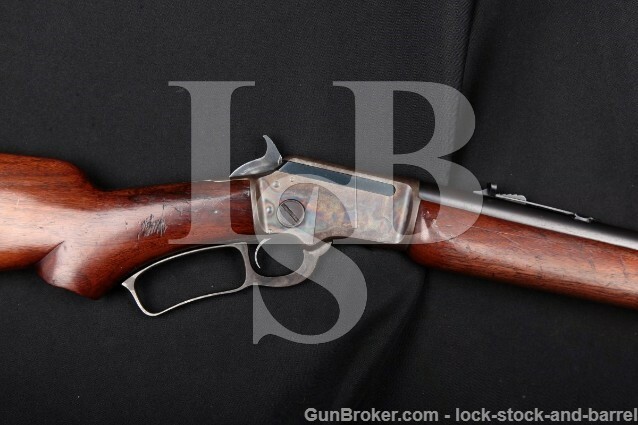 Our Assessment: This is a Marlin Model 39-A, an upgraded version of the model 39 which was itself the Marlin Firearms Corporation’s version of the older model 1891. The model 39 borrowed some features, such as the takedown design while incorporating several improvements during its production including an ejector design which could be held out of the way of the bore for cleaning. These design improvements were later retained by the Model 39-A. The tubular magazine gives this rifle the ability to use .22 Short, Long, and Long Rifle cartridges, making this an extremely versatile rifle which can be used for quiet pest-control in the yard to hunting small game and, according to promotional material from Marlin, target shooting out to 200 yards. This rifle is in Fine condition and is quite amazing for a nearly 80 year old firarm! This rifle will likely find its way into a Marlin collection, but if purchased by someone in need of a good pest-control, small game, or target rifle, there are few that can compete with the quality or history of Marlin’s Model 39-A. Please see our photos and good luck!